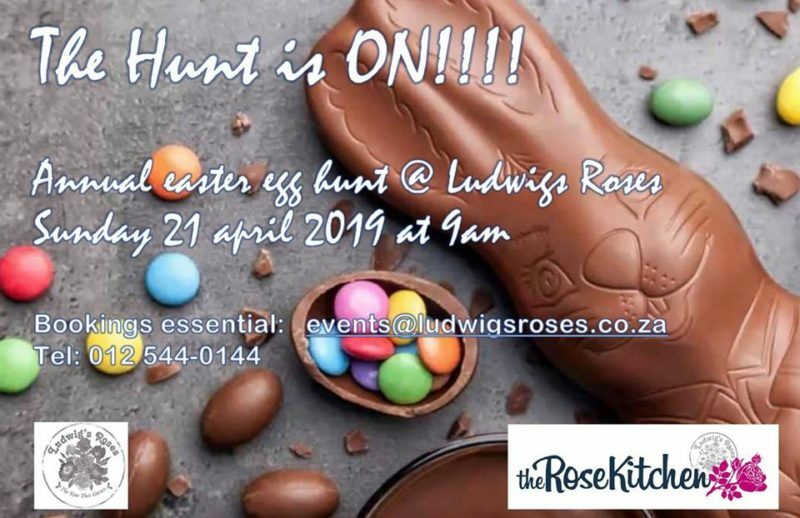 Easter Egg Hunt 2019 @ Ludwigs Roses – Wallmannsthal Pretoria, on Sunday, 21 April, at the Rose Shed & Kitchen. Fun filled day for the entire family, exciting Easter Egg Hunt and Golden Egg Treasure Hunt for the kids. Easter Egg Hunt 2019 @ Ludwigs Roses. Our well loved Easter Egg Hunt takes place amongst the roses on the farm on Easter Sunday, the 21st of April at 9:00am. The cost is R 180 per child. This year the hunt will span over a much larger area and be more fun than ever before. The Rose Kitchen has prepared a scrumptious Easter and Rose inspired buffet brunch to thrill the whole family! R 195 for adults and R 85 for children. Booking to participate in the Easter Egg Hunt and / or for the buffet breakfast brunch is essential. There will be a delicious buffet brunch with lots of activities for the kids! Free Mimosa’s for the parents!! Ludwig’s Rose Farm Is The Perfect Place To Spend A Fun Filled Morning With The Children. Searching For Treasures From The Easter Bunny…. R180 Per Child For An Easter Egg Hamper (All Ages Up To 15 Welcome). The Hunt Starts At 9am For All The Kids. This Year The Treasure Hunt Will Span Over A Larger Area Of The Farm. Help From The Easter Bunny As Well As Mom’s And Dad’s Is Encouraged. The Children Collect Tokens Hidden Amongst The Roses And Bushes To Redeem Their Hamper (Pre Ordered Only). There Will Also Be Great Entertainment For The Children – Jumping Castle, Face-Painting, Sand Art & A Bunny Photo Booth – Whilst The Grownups Enjoy A Complementary Mimosa. For Breakfast The Rose Kitchen Will Be Hosting A Scrumptious Buffet Brunch With Delicious Rose And Easter Inspired Dishes To Thrill The Entire Family! This Will Be Situated In The Rose Shed Events Venue Brunch Buffet – Adults R195pp / Children Under 11 Yrs R85, Children Aged Under 3 Years Eat Free. Brunch Served In The Rose Shed From 09h30 To 13h00 – Brunch Is Pre Booked Only. All Beverages Are Extra And Must Be Purchased. Bar And Waiter Provided For Your Convenience – Gratuity Charged. Take Your Drink & Hop Onto The Roofed & Cushioned Tractor Ride Around The Farm. Bring Your Binoculars To Watch The Splendour Of Bird Variety From The Dam Side.